Happy day after Halloween! Are you all candied out? Are you putting yourself on a diet of kale salads and quinoa dishes till Thanksgiving? I’m not going to go that far, but I do need some sort of cleanse from all the sugar I’ve been eating lately. It’s not candy that I need a break from, but baked goods. I have been baking way to many pumpkin muffins, cupcakes and bundt cakes lately, and I need to stop! Maybe with all of this new candy in the house, I won’t be asked to bake anything. I think the trick-or-treat candy will give me about a week off before the kids start getting sick of it and start asking me what I’m going to bake up. Since I have been baking a ton of sweets lately, I wanted to balance it out by making and eating some healthy dishes. 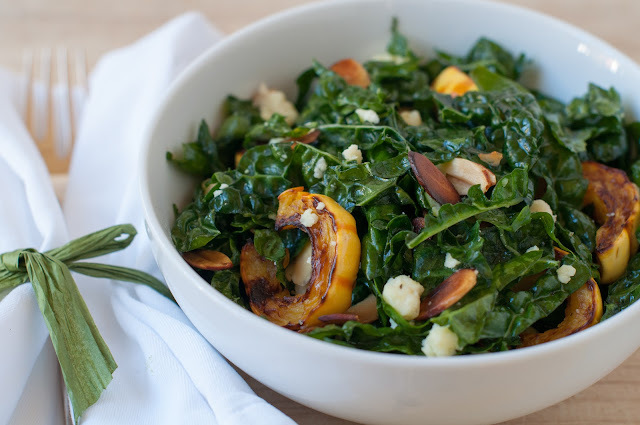 I made a new kale salad with delicata squash this week that I am loving! It’s got roasted delicata squash, roasted slivered almonds in it along with this amazing aged cheddar. Here’s a sneak photo of the salad below. Debbie and Natasha, you’re going to love this salad. I also whipped up another batch of quinoa cakes to pair with the kale salad. I made this batch with whole-wheat panko breadcrumbs. As you can see in the photo below, these ones held together a bit more, so I guess practice makes perfect! 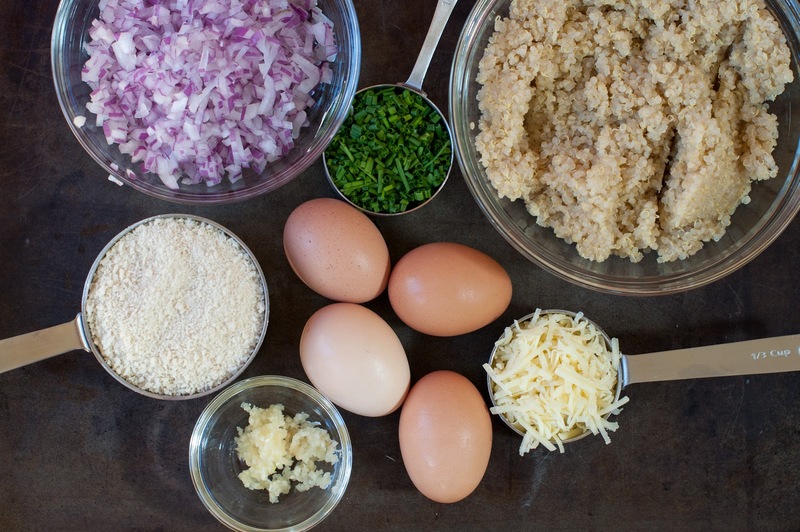 I love quinoa and couscous cakes because they’re the perfect on-the-go healthy lunch. They’re also the perfect accompaniment to any soup or salad. I make a batch of these early in the week, and then just re-heat 2-3 patties for lunch each day. They are filling and chock full or nutrition. I would categorize these quinoa cakes more in the “mommy” meal department though. My kids liked them, but didn’t love them like they do the couscous cakes. Eli said he liked the quinoa patties, but that was after he dunked the entire patty in his bowl of soup. I have yet to have him try them sans the soup. 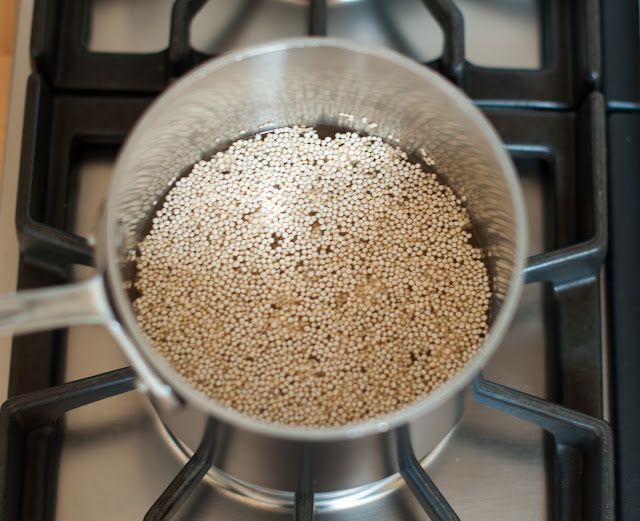 2 1/2 cups cooked quinoa, at room temperature – 1 cup of raw quinoa will get you approx 3 cups of cooked quinoa. 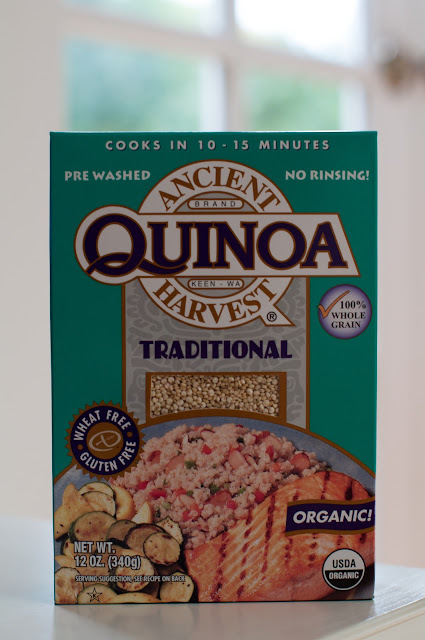 2 cups chicken broth, vegetable stock or filtered water – You will need this to cook the raw quinoa. I used chicken broth. 1 cup regular panko or whole-wheat panko breadcrumbs, plus more if needed – I have used both Ian’s regular and whole-wheat panko breadcrumbs, and they both tasted great. 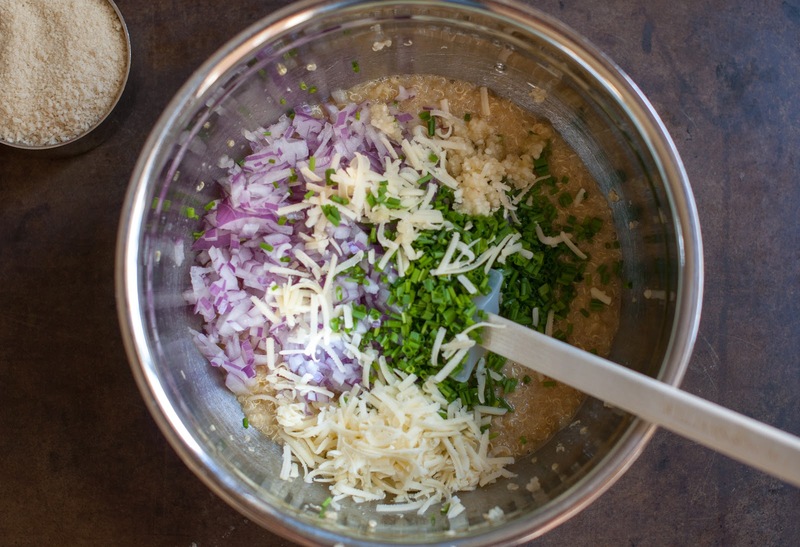 Prep all of your ingredients; chop up your onion, chop you your chives, mince your garlic cloves and grate up your cheese. I love using the below quinoa, as it doesn’t require any rinsing. Anything that makes my life easier is a plus in my book. In a small saucepan, place 1 cup quinoa and 2 cups chicken broth, veggie stock or filtered water and bring to a boil. I used chicken broth, as I think it gives the quinoa more flavor. 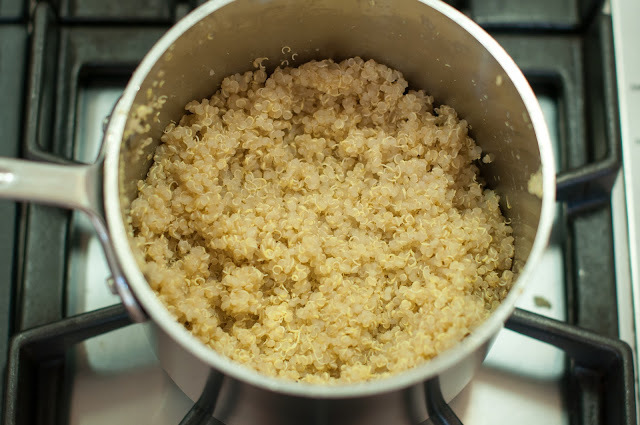 Once the quinoa has come to a boil, give it a stir, cover it and reduce the heat to simmer. 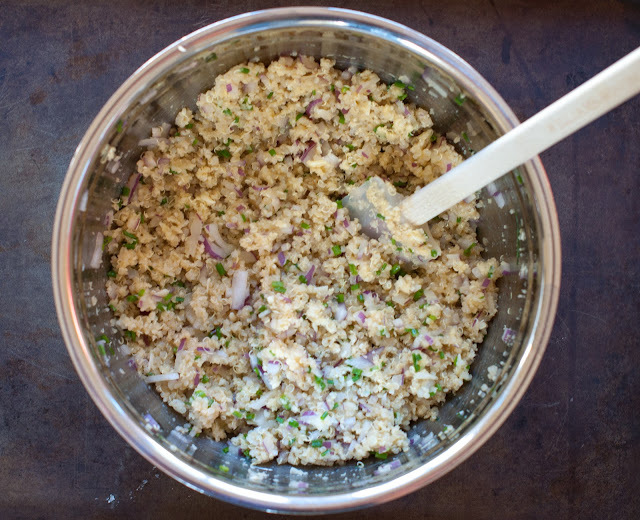 Cook the quinoa until all the water is absorbed, about 10-15 minutes. Note: If you’re using another brand of quinoa, please check the package for cooking instructions as they all vary. The quinoa is done when its tender and you can see the little quinoa curlicues. Let the quinoa cool and come to room temperature. Beat the 4 eggs in a medium to large bowl. Add in the 2 1/2 cups quinoa along with the 1/2 teaspoon salt and stir to combine. Add the chives, onion, cheese, and garlic and stir to combine. Add in the breadcrumbs and stir to combine. 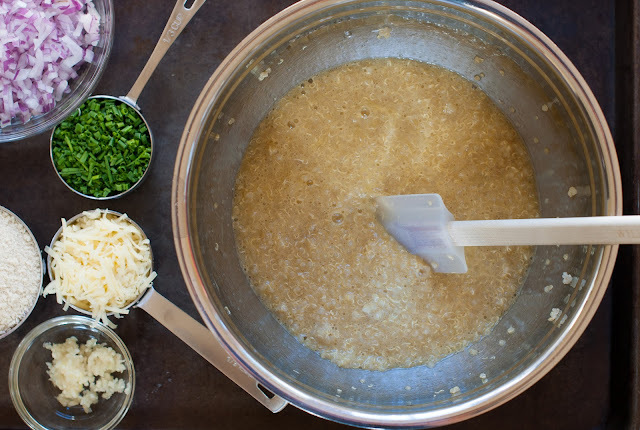 At this point you may want to make a test patty to see if you need to add more breadcrumbs if the mixture is to wet, or some water if the mixture is to dry. My mixture was the perfect consistency. Note: To make these a make-ahead meal, you can refrigerate the patties ahead of time and sauté them up right before dinner. You can also refrigerate the mixture as is, and make the patties right before you sauté them. Either way works. The mixture (raw) can be kept covered in the refrigerator for up to 2 days and cooked for about 5 days. Press the mixture into a 1/4 measuring cup, smooth the top, and invert the measuring cup over a plate to release the patty. You may have to gently tap the back of the cup a few times to get the patty to release. Repeat with the remaining mixture till it’s all gone. 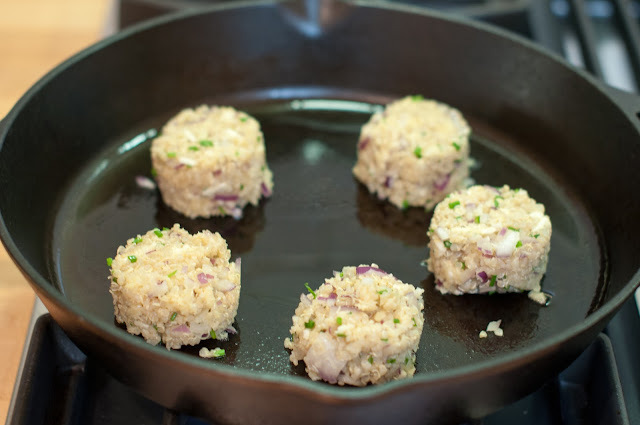 Add 5 of the quinoa patties to the skillet. 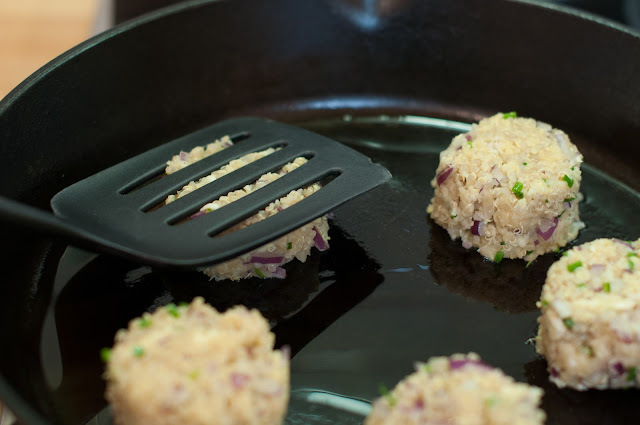 Take a spatula and gently press down on the patties so that they flatten down a bit. Note: Your patties might crumble or fall apart a bit during this process, but don’t fret, you can mush them back together with your hands. These cakes don’t have to be perfect and a few of mine crumbled in places and didn’t look so perfect, but they still tasted the same. Cover and cook the patties until the bottoms are crisp and golden brown, about 7-10 minutes (check after 5 minutes if you hear a lot of sizzling). Increase the heat to medium if there is no browning after 10 minutes. Flip the patties with a spatula and cook the second side until crisp and golden brown, about 7 minutes. If all the oil is absorbed, feel free to add a bit more so that the 2nd side of the patties get browned, or be sure to rub them around in the remaining oil. Note: I have cooked the patties covered and uncovered. They seem to cook faster when they are covered. If you don’t have a cover to fit your pan, then cook the patties uncovered on medium heat. Both methods work great! Transfer the cooked patties to a wire rack to cool down a bit. 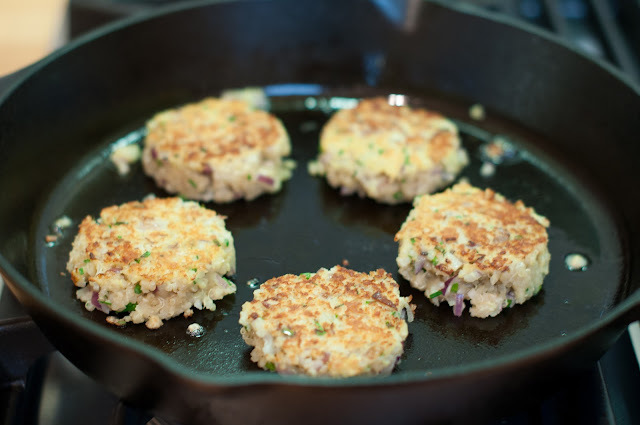 Add another tablespoon of oil to the skillet and cook the remaining patties the same way. You can also bake the patties. Just form the mixture into twelve 1-inch thick patties. Oil a baking sheet, and arrange the patties with a bit of space between each. Bake for in a pre-heated 400 degree oven for 20 minutes, or until the bottoms are brown. Flip and bake for another 5 minutes. I prefer sautéing them, as they seem to brown and crisp up a bit more. I always make up a batch of these earlier in the week, and then just re-heat 2-3 patties at a time in a pre-heated oven at 250-degrees to warm them up. The cooked patties will stay good for about 5 days when kept well covered in the refrigerator. Below is a photo of the quinoa cakes made with the regular panko breadcrumbs. Below is a photo of the quinoa cakes made with the whole-wheat panko breadcrumbs. Pair these with a salad or your favorite soup. I paired them with my heirloom tomato soup as well as my roasted red pepper soup and they were the perfect side. These would also taste amazing topped with some tzatziki yogurt sauce. Got leftovers? Just throw them in a 250-degree oven to warm them up. 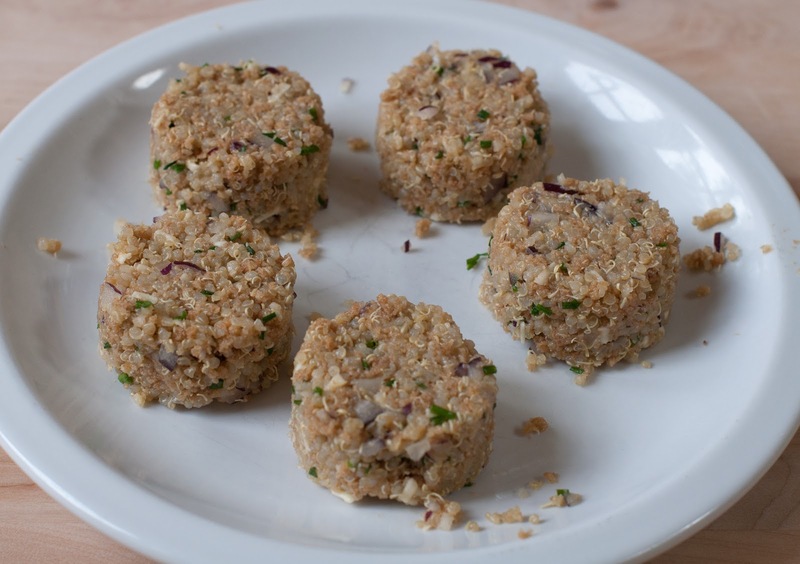 If you like the idea of quinoa cakes, then try these couscous cakes next time. Hey Dot’s and Stripe’s, I hope you enjoy these quinoa cakes! Want to try a crispier and cheesier quinoa cake? Then try my quinoa cakes. They are oozing with cheese. Made these and loved them. Made a few changes which proved to be even more delicious. Put Quinoa in heated pan and seared for five minutes. Makes quinoa so yummy. Then just added chicken broth. To spice mixture, put two eggs, less bread crumbs. 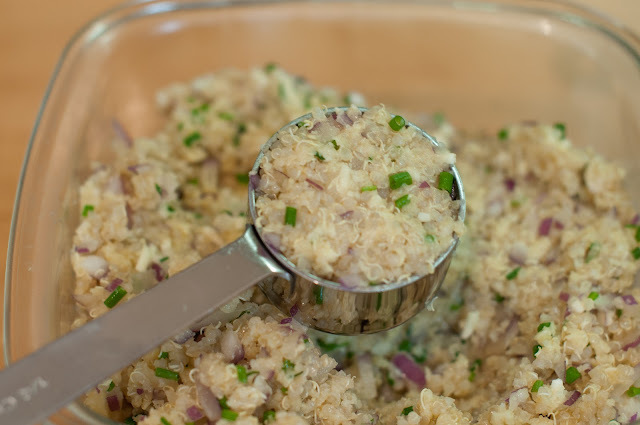 Half tsp sea salt, chives and red onion minced, Parmesan cheese-1/4 cup, 1minced carrot, 3cloves garlic and 1inch fresh ginger minced, 2tsps of sesame oil, 1/2 cup breadcrumbs, and some fresh basil. I added cooled quinoa and made patties. So delicious. I’ve frozen some which is great. I made these last night and they were so good! I was actually pretty blown away by how flavorful they were and I’m pretty excited that I have a bunch of leftovers for the rest of the week. Thanks! Hi!! Great recipe!! loved it 🙂 how many calories would you say is in each patty? Totally needed to comment on this. I made these, and couldn’t be happier. Really they are absolutely delicious!!! Now I should say, I’m not one to follow measurements in recipes. I measured the quinoa and put the right amount of eggs, but it turned out too watery, soooo I added more breadcrumbs, parmesan and actually a little homemade lowfat hummus. Slightly less healthy (with extra breadcrumbs and parmesan), but they came out unbelievably juicy and delicious. I actually baked half and fried half. You were right, the fried ones were better, although the baked ones actually got pretty brown, they were just a little dry. I’m definitely going to make these often and try a bunch of other recipes from your site. I just found your website while researching how to store my kale (lol). Lots of great ideas!!! Tried these quinoa cakes for lunch, delicious! I followed the receptive verbatim except that I only had a half cup of bread crumbs. I added 3 tbsp of buckwheat flour and that seemed to do the trick. I ate them with a swirl of balsamic reduction. Thanks for sharing all of your wonderful recipes and tricks. I love your recipes for Quinoa, Kale, and Chocolate Cake! YUM Thanks so much!!! Hi! I really want to try these tonight but I don’t have any panko breadcrumbs…do you think I could use regular ones? The quinoa patties were delish for sure!!! I also tallied up calories based on ingredient’s calories and only around 140! WOW! Can’t wait for my kiddos to get home from school to give them a try! I just made these and they turned out great! Issue is I made too many without remembering I am leaving town for the holidays, do you think they would freeze well? Hi Janelle! I’m so glad you and your family loved both the patties and the soup. Thanks for letting me know! 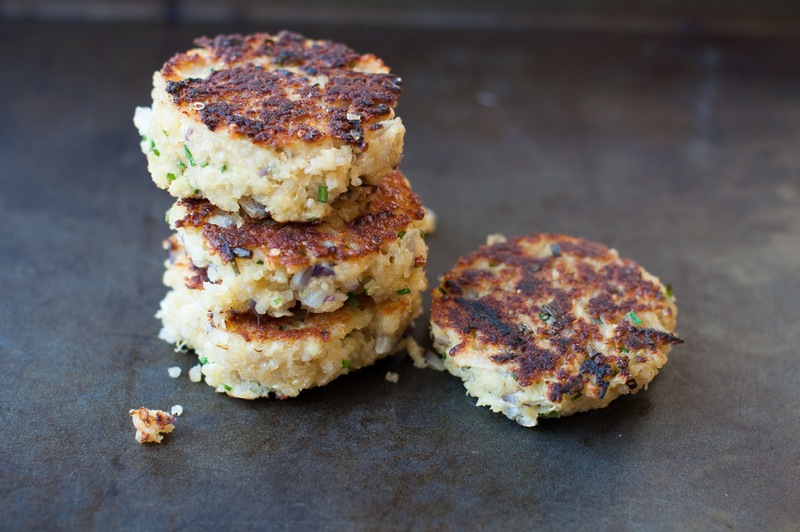 My kids prefer the couscous patties to the quinoa patties, but I’m slowly getting them there. It’s always nice to hear from a fellow Marin resident, so thanks for saying hi! Tremendous idea! Printed this out and am looking forward to making it this weekend. We make something very similar all the time! I’ll try out your additions next. We mix olive oil mayo with roasted garlic, the juice/zest of one lemon and a little cayenne for a tasty dip for them. Goes great with salad! That dip sounds delish! I’m going to have to give it a shot! Your quinoa patties looks great. I just bought some from the prepared counter at Whole Foods and they were pretty good, but these look way better. Oooohhhh excited to try these out!! Thanks! Loving this recipe – we have been eating quinoa like crazy. Great stuff. Definitely going to give this a whirl. Hi Denise! Great to hear from you. Life is great! It’s been busy, but in a good way. It’s funny you stopped by because I was just at your blog the other day checking out that amazing pumpkin pull apart bread. I also love the looks of your sage and walnut pesto. 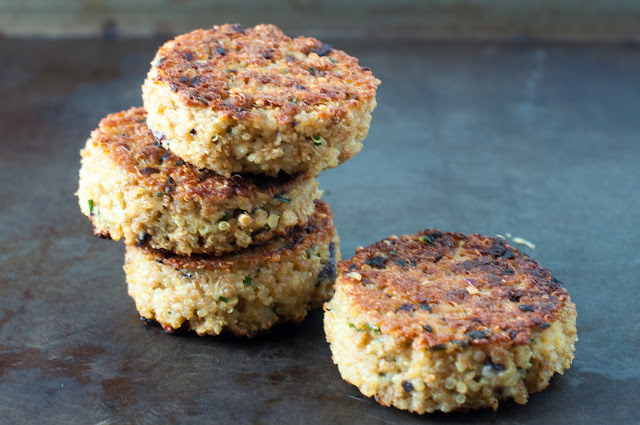 Let me know what you think about the quinoa patties when you give them a shot! Really delicious! My family loved them! As a FYI – there was not mention of when to add the breadcrumbs except for when you mention adding more breadcrumbs. Thanks for the recipe! I see delicata squash in that salad – my favorite! Hi Becca! This was my first time trying delicata squash. It’s so good and so easy to prepare. They look great, Jackie, and good job getting them to stick together – that’s sometimes tricky with quinoa or any veggie patties!